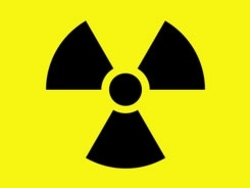 Guides about health hazards in your home or apartment. Lead poisoning has been in the headlines ever since the Flint water crisis brought national attention to the problem. Chicago is grappling with its own lead poisoning crisis, which is hitting our youngest residents the hardest. Imagine if you found out your child had lead poisoning. No parent wants to receive that type of news. Now imagine that your two youngest children – twins – have elevated lead blood levels. 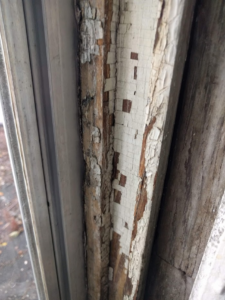 A deteriorating window frame with chipping and peeling paint with a distinct alligator pattern (which usually indicates the presence of lead based paint) inside Ms. W’s apartment. This is how we first met Ms. “W”. 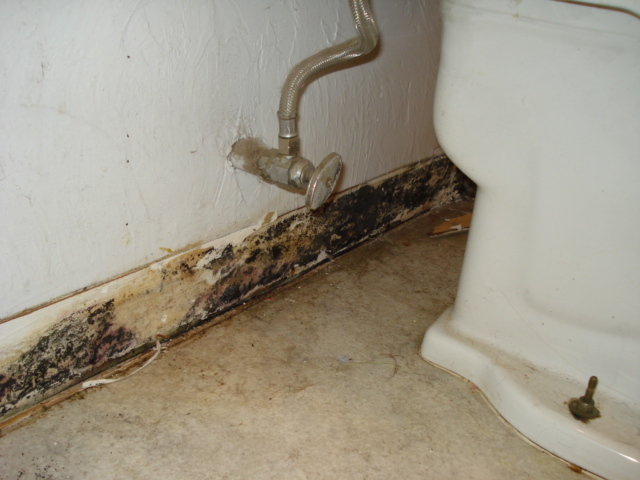 After a local health clinic discovered her children’s elevated lead blood levels, Ms W contacted MTO, and a Healthy Homes organizer conducted a visual inspection at her home. The deteriorating plaster walls had started to disintegrate. Half of the window frames had chipped, peeled, and cracked paint. 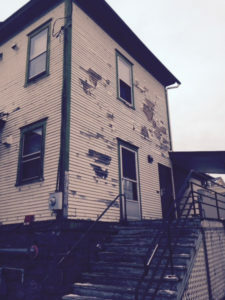 A subsequent inspection by the Chicago Department of Public Health confirmed the assessment – there were high levels of lead in the entire unit. 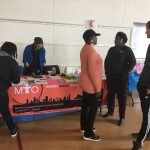 Over the course of the next few weeks, MTO’s Healthy Homes Organizer provided a letter of support, collected visual documentation of the unit conditions, and shared resources for emergency housing assistance. While Ms. W. explored her options she received more devastating news, her three other children – all under the age of six – had also been poisoned. Now, her landlord was trying to evict Ms W and her family. 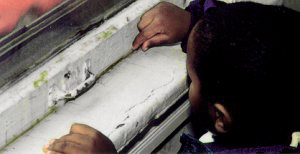 When an unlicensed worker attempted to remediate the lead without proper safety protocols in place, MTO was able to get a city inspector to stop the illegal abatement, which was further harming her children. Ms W was partnered with a pro-bono lawyer to fight the eviction. While Ms. W. awaits to hear about a new apartment to move to she has expressed immense gratefulness for MTO’s assistance in her advocacy for safe and healthy housing. But Ms. W wouldn’t have to experience any of this if Chicago had a proactive rental inspection program. The Chicago Healthy Homes Inspection Program (CHHIP) is a campaign lead by MTO to create just that. Hazards like lead, mold, pest infestations, and other asthma triggers can and should be caught before they become a crisis. 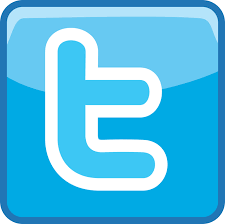 The current building inspection system is a complaint-based service provided by city inspectors. This means that tenants hold the burden of requesting proper maintenance, property owners can neglect buildings without regular code enforcement, and families are forced to relocate or live with egregious conditions affecting their health. In today’s economy, moving is not always a viable option. We believe that the City should initiate a proactive inspection program that could identify home-based health hazards before they poison our children. 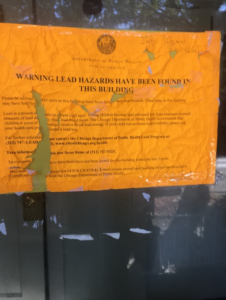 Lead Hazard sticker that was placed on door after formal lead inspection by the city of Chicago’s Department of Public Health. Chicago’s lead poisoning crisis is silently harming our youngest and most vulnerable residents. 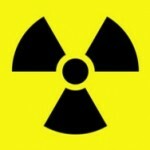 The Center for Disease Control (CDC) says, “no levels of lead is safe for anyone”. 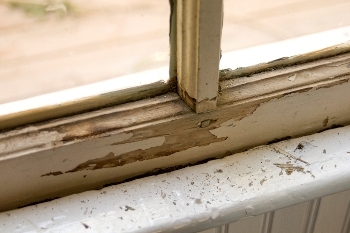 The CDC wants to eliminate lead poisoning in children by the year 2020. If Chicago wants to get serious about achieving this goal, we need to address the substandard housing that exists in our city and make lead prevention and remediation a priority. Our children’s lives are at stake. MTO is excited to announce our continued partnership with the Chicago Community Trust through a 2nd year of being awarded CCT’s Housing + Health grant. Because of our supporters we are able to assist more Chicago renters and children with housing-health issues and organize for equitable solutions and policies that promote safe, healthy, and decent affordable housing for all. After all HOUSING is a HUMAN RIGHT! If you or someone you know is in need of information about their rights as a renter or in need of assistance from our Healthy Homes Team contact MTO’s Tenants’ Rights Hotline, M-F; 1pm-5pm at 773-292-4988 or visit our offices M-Th 1pm-4:30pm. 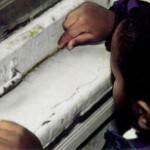 We Know How To Stop The Epidemic Of Lead Poisoning. Why Aren’t We? We know exactly how to eliminate lead hazards to keep children safe. 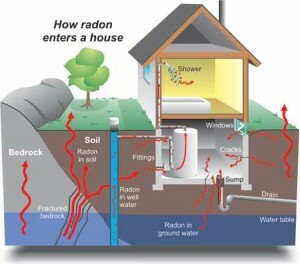 Yet federal regulations that are supposed to protect families in any kind of housing, public and private, have lagged far behind current scientific research and mean thousands of children across the country are being poisoned by their homes. In fact, it’s just as common for families in run-down private homes in Chicago to be faced with the prospect of lead poisoning, a reality John Bartlett, executive director of the Metropolitan Tenants Organization, sees firsthand. 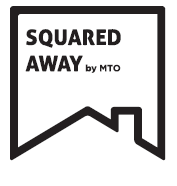 The poor families who call [MTO’s] hotline are often forced into unbearable choices in private housing. Preventative measures are even rarer in private housing, as inspections aren’t required at all. As a result, parents often have no idea what they’re moving into. “The question becomes, is it better to have a home or not,” he said. “Do you end up in a shelter situation or do you take what you can get? Tenants lack the resources to go anywhere else, but they also lack the resources to stand up to the landlord,” Bartlett said. 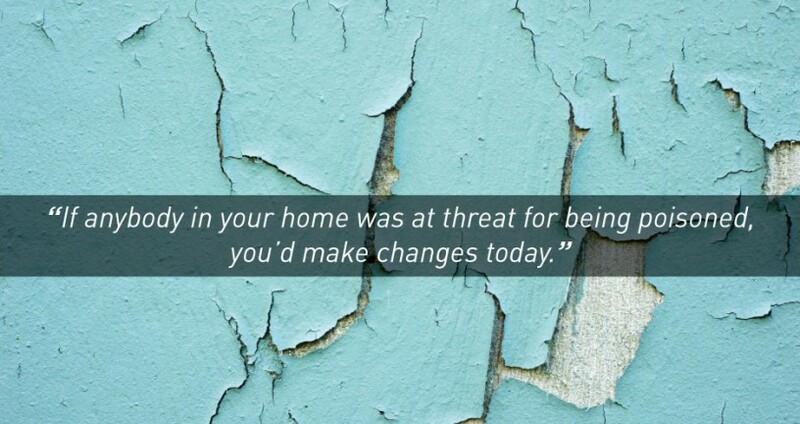 And they might risk getting kicked out of their home rather than an actual fix. “Oftentimes landlords, instead of wanting to get rid of the lead, want to get rid of the tenant,” he continued. That’s a particular problem in private housing, where the protections against wrongful evictions are weaker. Some cities and states have instituted proactive rental inspection programs, which require housing to be checked at regular intervals, rather than waiting for a resident to make a complaint. That not only means that lead hazards are hopefully abated before poisoning becomes an issue, but that tenants who might fear taking action against landlords don’t have to shoulder the burden. Posted in Healthy Homes, Latest News, LeadLeave a Comment on We Know How To Stop The Epidemic Of Lead Poisoning. Why Aren’t We? 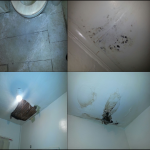 Ms. Jones told her landlord right away when her daughters’ bedroom ceiling was leaking. She told him that he needed to come look at it as soon as possible. But the landlord never showed up. In mid-June, when a heavy storm hit the Roseland community, her daughters were sleeping in their beds when suddenly the roof and ceiling came crashing in. 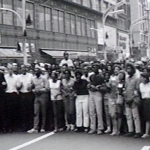 Fortunately, the girls were not physically injured, but they remain traumatized by the incident. Two weeks passed before the landlord came. Ms. Jones had to put up plastic over the gaping hole in the ceiling. Finally, the landlord came over to fix the roof – but he still hasn’t fixed the interior damage. Mold continues to thrive. 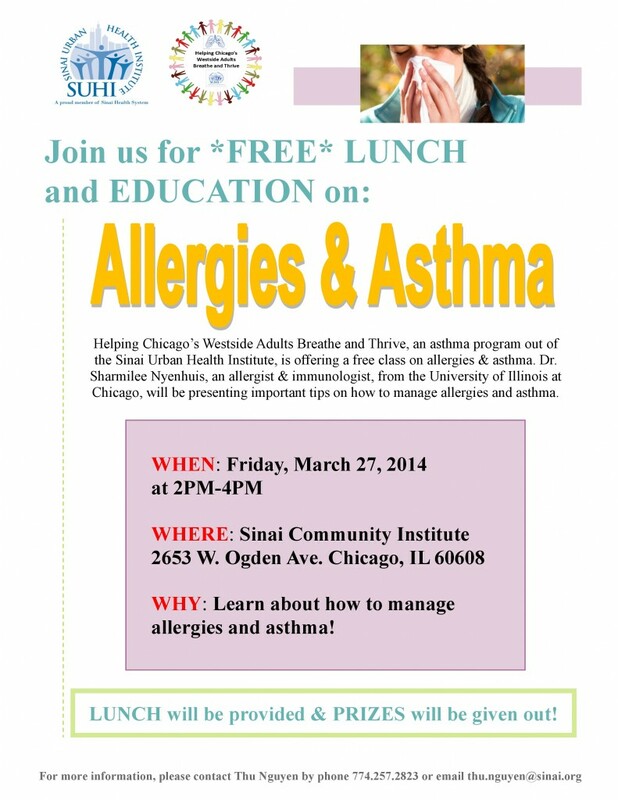 Her daughters both have asthma and can’t sleep in their room anymore because it causes their asthma to flare up. 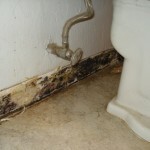 Mold is a major asthma trigger. Currently, they have to sleep in the same bed with their mother down the hall. But the repair problems don’t end there. All but one of the windows in this single-family home are missing screens. 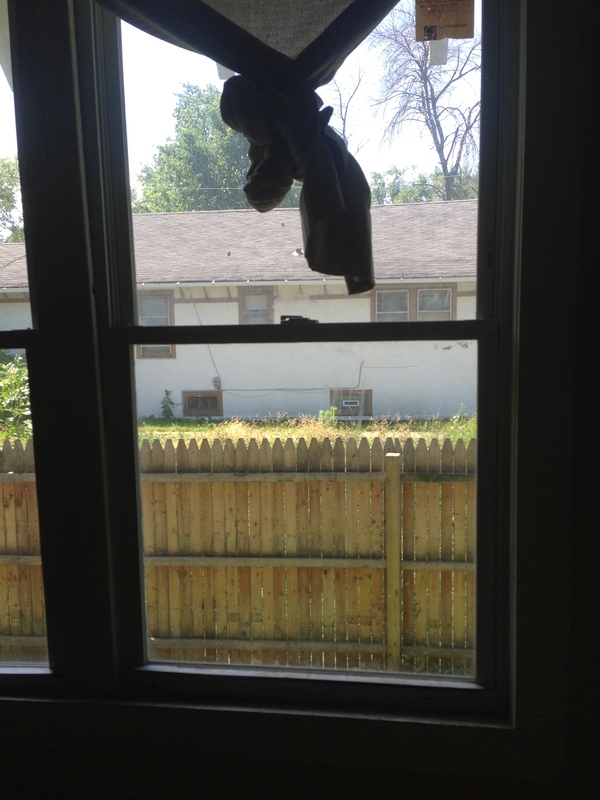 According to the Chicago Building Code Chapter 13-196-560, window screens are required from April 15 to November 15. Again and again Ms. Jones has told the landlord about the screens. He says he will get around to it but never does. Her family says they feel unsafe and can’t open their windows without dust and insects coming inside. To make matters worse, there is a rodent infestation due to holes throughout the structure of the home. Mice are also a major asthma trigger. Ms. Jones has tried everything from traps to glue boards but until the holes are fixed, mice will keep coming in. And her daughters will keep having asthma attacks at home, which means they spend additional money they don’t have on expensive medication and trips to the Emergency Department. For renters across Chicago, this story is all too familiar. Ms. Jones has no mailing address for her landlord to send a certified 14 day letter so she has always sent him texts when issues come up. Tenants are responsible for notifying owners of issues immediately when they occur, but what can be done when landlords fail to respond? 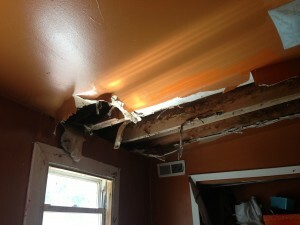 Small issues turn into larger ones, like a roof and ceiling crashing down in the middle of the night. The Chicago Building Code needs to be enforced. Landlords should register their properties with the City so tenants have a resource for contact information for owners and the City has an inventory of properties. Major cities across the country are adopting proactive rental inspection programs to address issues such as absent, negligent owners. Programs require owners to register properties and cyclical inspections occur to ensure compliance with existing building codes. We believe all renters deserve to live in safe and healthy homes so we are working on bringing a proactive inspection program to Chicago.